This image was scanned from the publication - How Firm a Foundation: A History of the Township of Cramahe and the Village of Colborne in Cramahe's Digital Archives (3bk), p.35. 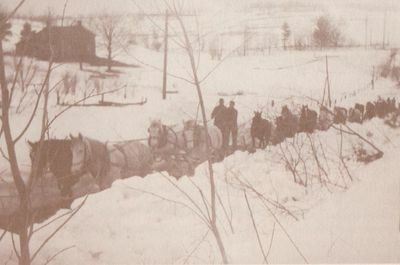 The caption reads: "Horse-powered snow-plowing: This photo was taken in circa 1950 in the Dundonald area, but reflects early methods of clearing roads of snow using teams of horses. The horses behind the plow are being rested to take their turn when those in front are tired out."